Wave Hill events May 2‒May 9: Spring Insect Day! Wave Hill events April 25‒May 2: Arbor Weekend! Today, Bronx Assembly Member Michael A. Blake filed the required paperwork with the Federal Elections Commission announcing his intention to ​run for New York’s 15th Congressional District in the U.S. House of Representatives. With exactly fourteen months until the primary election, Michael is uniquely qualified for this new role as a local organizer, former White House aide to President Obama, effective three-term Assembly Member and coalition builder. “My team and I continue to keep Congressman Serrano and his family in our prayers as he battles Parkinson’s and stands up for us in Washington, and, I pledge to build on his legacy while seeking to take the South Bronx to new heights. “I am committed to bringing all people within our district together, regardless of our different nations of origin, immigration status, languages, races, ethnicity, gender and sexual orientation to enact policies that serve all of the people. It is time for us to prove once more that public service is here for the people and to make clear that we have and always will Believe in The Bronx. Join us on this journey at blakeforcongress.nyc." Hoy, el miembro de la Asamblea del Bronx, Michael A. Blake, presentó la documentación requerida ante la Comisión Federal de Elecciones y anunció su intención de postularse para el 15 ° Distrito Congresional de Nueva York en la Cámara de Representantes de los EE. UU. Con exactamente 14 meses hasta la elección primaria, Michael tiene una calificación única para este nuevo papel como organizador local, ex asesor de la Casa Blanca para el presidente Obama, miembro efectivo de la Asamblea por 3 mandatos y creador de coaliciones. “Cuando nos unimos y creemos en el Bronx, todo es posible, para nuestras familias, para nuestras comunidades y para nuestro futuro colectivo. Con un miembro del Congreso en Washington luchando por empleos mejor pagados, por viviendas asequibles, por una mejor cobertura de atención médica y educación para los niños, por proteger la dignidad de los inmigrantes y nuestras familias del sur del Bronx, y luchando por la financiación y los recursos Que nuestros vecindarios necesitan, podemos lograr cosas extraordinarias. Quiero ser ese luchador para ti, por lo que he decidido postularme para el 15º Distrito del Congreso en el Bronx ". “Mi equipo y yo continuamos manteniendo al Congresista Serrano y su familia en nuestras oraciones mientras él lucha contra la enfermedad de Parkinson y nos sigue defendiendo en Washington. Yo me comprometo a continuar con su legado mientras busco llevar al Sur del Bronx a nuevas alturas”. “He tenido el honor de servir a este país en la Casa Blanca en la administración del Presidente Obama como Director de Afro-Americanos, Minorías y Negocios de Mujeres. Sin embargo, mi mayor honor fue regresar a mi hogar en el Bronx para traer cambios positivos como miembro de la Asamblea, como el programa My Brother's Keeper, becas y fondos en Raise The Age to Diversity In Medicine y fondos para la mejora de NYCHA. "Le pido a los residentes del 15 ° Distrito Congressional que me dé la oportunidad de ser nuestra próxima voz en Washington, DC, donde utilizaré mi experiencia federal y local junto con mi visión sobre la equidad para representar a nuestro distrito". “Estoy comprometido a reunir a todas las personas dentro de nuestro distrito, independientemente de nuestro origen, estatus migratorio, idioma, raza, etnicidad, género y orientación sexual. Es hora de que probemos una vez más que el servicio público está aquí para la gente y que quede claro que tenemos y creemos en el Bronx. Únase a nosotros en este viaje en blakeforcongress.nyc". Geoffrey S. Berman, the United States Attorney for the Southern District of New York, and Ray Donovan, the Special Agent in Charge of the New York Division of the U.S. Drug Enforcement Administration (“DEA”), announced criminal charges against Rochester Drug Co-Operative, Inc. (“RDC”), one of the 10 largest pharmaceutical distributors in the United States; Laurence F. Doud III, the company’s former chief executive officer; and William Pietruszewski, the company’s former chief compliance officer, for unlawfully distributing oxycodone and fentanyl, and conspiring to defraud the DEA. Mr. Berman’s Office also filed a lawsuit against RDC for its knowing failure to comply with its legal obligation to report thousands of suspicious orders of controlled substances to the DEA. Mr. Berman also announced an agreement (the “Agreement”) and consent decree under which RDC agreed to accept responsibility for its conduct by making admissions and stipulating to the accuracy of an extensive Statement of Facts, pay a $20 million penalty, reform and enhance its Controlled Substances Act compliance program, and submit to supervision by an independent monitor. Assuming RDC’s continued compliance with the Agreement, the Government has agreed to defer prosecution for a period of five years, after which time the Government will seek to dismiss the charges. The consent decree is subject to final approval by the court. From 2012 through March 2017, as alleged, RDC knowingly and intentionally violated the federal narcotics laws by distributing dangerous, highly addictive opioids to pharmacy customers that it knew were being sold and used illicitly. At the direction of its senior management, including Doud and Pietruszewski, RDC supplied large quantities of oxycodone, fentanyl, and other dangerous opioids to pharmacy customers that its own compliance personnel determined were dispensing those drugs to individuals who had no legitimate medical need for them. RDC distributed controlled substances to those pharmacies even after identifying “red flags” of diversion, including dispensing highly abused controlled substances in large quantities; dispensing primarily controlled substances; dispensing quantities of controlled substances in amounts consistently higher than accepted medical standards; accepting a high percentage of cash for controlled substance prescriptions; dispensing to out-of-state patients; and filling controlled substances prescriptions issued by practitioners acting outside the scope of their medical practice, under investigation by law enforcement, or on RDC’s “watch list.” In addition, and at Doud’s direction, RDC frequently brought on pharmacy customers that had been terminated by other distributors. RDC’s employees, including in conversations with Doud and Pietruszewski, described some of the company’s customers as “very suspicious,” and even characterized particular pharmacies as a “DEA investigation in the making” or “like a stick of dynamite waiting for [the] DEA to light the fuse.” Nonetheless, throughout the period in question, RDC, at the direction of Doud, increased its sales of oxycodone and fentanyl exponentially. From 2012 to 2016, RDC’s sales of oxycodone tablets grew from 4.7 million to 42.2 million – an increase of approximately 800 percent – and during the same period RDC’s fentanyl sales grew from approximately 63,000 dosages in 2012 to over 1.3 million in 2016 – an increase of approximately 2,000 percent. During that same time period, Doud’s compensation increased by over 125 percent, growing to over $1.5 million in 2016. From 2012 through March 2017, as alleged, RDC took steps to conceal its illicit distribution of controlled substances from the DEA and other law enforcement authorities. Among other things, RDC made the deliberate decision not to investigate, monitor, or report to the DEA pharmacy customers that it knew were diverting controlled substances for illegitimate use. Because it knew that reporting these pharmacies would likely result in the DEA investigating and shutting down its customers, RDC’s senior management, including Doud, directed the company’s compliance department – and in particular Pietruszewski – not to report them, and instead to continue supplying those customers with dangerous controlled substances that the company knew were being dispensed and used for illicit purposes. Among other things, pursuant to Doud’s instructions, and contrary to the company’s representations to the DEA, RDC opened new customer accounts without conducting due diligence, and supplied those customers – some of whom had been terminated by other distributors – with dangerous controlled substances. Additionally, RDC knowingly and willfully avoided filing suspicious order reports with the DEA as required by law. Between 2012 through 2016, the company identified approximately 8,300 potentially suspicious “orders of interest,” including thousands of oxycodone orders, but the company reported only four suspicious orders to the DEA. As alleged, RDC did not report suspicious orders in order to protect the profit being generated by customers dispensing large quantities of controlled substances. As a result, the DEA’s ability to identify and prevent the illicit dispensing of highly addictive controlled substances by several of RDC’s pharmacy customers was impeded. ROCHESTER DRUG CO-OPERATIVE, INC., is a wholesale distributor of pharmaceutical products, including controlled substances, headquartered in Rochester, New York. It is one of the nation’s 10 largest distributors of pharmaceutical products – and the fourth largest in the New York area – with over 1,300 pharmacy customers and over $1 billion in revenue per year. RDC has been charged in an Information with conspiracy to violate the narcotics laws, conspiracy to defraud the United States, and willfully failing to file suspicious order reports. RDC has also been sued in a civil complaint for its failure to file suspicious order reports. LAURENCE F. DOUD III, 75, of New Smyrna, Florida, has been charged with one count of conspiracy to distribute controlled substances, which carries a maximum sentence of life in prison and a mandatory minimum sentence of 10 years, and one count of conspiracy to defraud the United States, which carries a maximum prison term of five years. WILLIAM PIETRUSZEWSKI, 53, of Oak Ridge, New Jersey, has been charged with one count of conspiracy to distribute controlled substances, which carries a maximum sentence of life in prison and a mandatory minimum prison term of 10 years; one count of conspiracy to defraud the United States, which carries a maximum sentence of five years in prison; and one count of willfully failing to file suspicious order reports with the DEA, which carries a maximum sentence of one year in prison. PIETRUSZEWSKI pled guilty to these charges, pursuant to a cooperation agreement, on April 19, 2019. The maximum potential sentences are prescribed by Congress and are provided here for informational purposes only, as any sentencing of the defendants will be determined by the judge. Mr. Berman praised the investigative work of the DEA’s Westchester Tactical Diversion Team, comprising Special Agents, Diversion Investigators, and Task Force Officers from the DEA, Westchester County Police Department, Town of Orangetown Police Department, Rockland County Sheriff’s Office, Woodbury Police Department, Yonkers Police Department, New Windsor Police Department, and Putnam County Sheriff’s Office. The charges contained in the Doud Indictment and RDC Information are merely accusations, and the defendants are presumed innocent unless and until proven guilty. “This case should be decided on the merits of the arguments and according to the letter of the law. I strongly believe that the facts and the record support our claims and am hopeful that the Honorable Justices will agree. At the same time, we cannot fail to recognize that—at the heart of this matter—there is more at issue here than just surveys and statistics. It is about how our government is organized, how power is equally divided, and how aid is distributed equitably." Mayor Bill de Blasio announced that the city will try an experimental new transit improvement on 14th Street, and also make permanent the bike lane improvements made on Grand Street in Brooklyn and 12th /13th Streets in Manhattan. 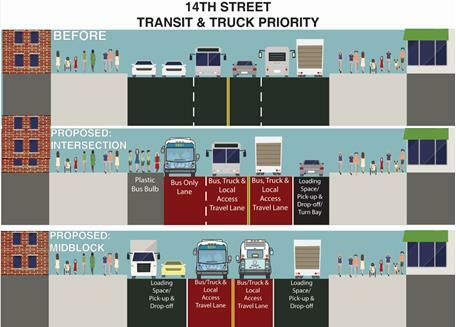 On 14th Street, the City will pilot Transit/Truck Priority lanes, disallowing through traffic from 3rd Avenue to 9th Avenue, to coincide with the launch of the M14 SBS service in June. This pilot is expected to last 18 months. 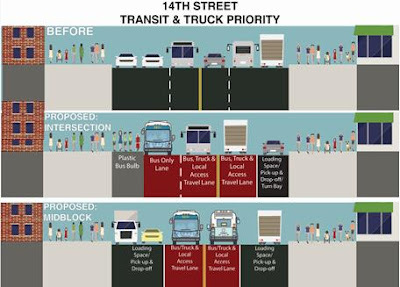 14th Street Transit/Truck Priority (TTP) – The MTA and DOT announced earlier this year that M14 SBS would be coming to the 14th Street corridor in 2019; the corridor carries one of the most intensely used bus routes in the city, with the M14A/D carrying 27,000 daily riders and providing a critical connection from the Lower East Side to Union Square and the Meatpacking District. To make sure these buses move quickly and reliably, DOT studied international best practice for busy transit corridors, including along King Street in downtown Toronto, where in 2017, new regulations that prioritized transit and pedestrian uses were piloted along a major streetcar route. The Toronto changes, popular with transit riders, dramatically reduced travel times and increased safety along the corridor – and have been since made permanent. · Only buses, trucks and emergency vehicles will be able to use 14th Street between 3rd and 9th Avenues as a through route. · Local traffic will still be permitted to make pickups and drop-offs along the corridor and access garages, but cars will always need to turn right at the next possible location. Left turns will not be allowed. · New curbside regulations will prioritize short-term loading and passenger pickup activity. · Intersections along 14th Street will be designed with new turn lanes where appropriate to ensure that bus lanes will remain clear. Intersections will also receive Vision Zero treatments, including painted curb extensions that enhance pedestrian safety. The new design builds on proposals made during the original L train planning process, but also incorporates key feedback from local residents to ensure that curb access remained available, and that through truck traffic not be diverted to local streets. Construction will begin this spring for completion in time for the launch of the M14 SBS in June. During that time, DOT will conduct significant outreach to stakeholders, including the five different community boards served by 14th Street. This will be accompanied by educational campaigns for the people who use 14th Street. The MTA has announced that in the period this spring prior to the implementation of Select Bus Service, L riders will benefit from increased M14 service on nights and weekends. DOT expects to enforce the new TTP lanes through automated cameras along 14th Street. The agency will publicly announce the commencement of camera enforcement, which will not begin until at least 60 days after the new SBS route is established. Grand Street Protected Bike Lane – The City will pursue making the bike lanes along the Grand Street corridor in Brooklyn permanent. Between Waterbury Street and Vandervoort Avenue, DOT will modify the protected bike lanes to help accommodate the needs of industrial businesses along this section of the corridor. The project will also include other adjustments made in response to community and business feedback -- including additional metered parking and new loading zones around the corners from Grand Street. 12th Street/13th Street Protected Bike Lanes – DOT will also pursue permanently retaining bike lanes it had installed in 2018 along 12th and 13th Streets in the Village. Since being painted last fall, cyclist usage of the nearly three miles of new protected lanes over the winter has outpaced bike counts from last summer. The new lanes have become a part of the agency’s crosstown protected bicycle lane strategy -- along with recently installed lanes on 26th and 29th and a planned pair along 52nd and 55th Streets in Midtown. In response to community concerns, more delineators and loading zones will be added. Changes to University Place and Union Square West -- DOT will also pursue the retention of pedestrian-friendly changes it has made to roadway spaces along both University Place (between West 13th and 14th Streets) and Union Square West (between West 14th and 15th Streets and between West 16th and 17th Streets). On University Place, a “shared-street” arrangement will be fully implemented, allowing eastbound vehicles on 14th Street to turn right and proceed slowly through that block. The blocks of Union Square West would remain closed to general traffic. Since their installation began in 2018, these spaces have been heavily used by pedestrians and cyclists. Mayor Bill de Blasio appointed John Paul Farmer as the new Chief Technology Officer. As CTO, Farmer will lead the City’s efforts to use innovative technology to provide better services to all New Yorkers. “Technology helps us provide equal access to services for all New Yorkers. I welcome John, who brings a wealth of experience working at the intersection of technology and public service. With his help, we will continue to innovate on behalf of all New Yorkers and further establish our city as a global leader in the tech field. I also want to thank Alby Bocanegra for his service as Interim Chief Technology Officer,” said Mayor de Blasio. “New York is the greatest city in the world, and I’m thrilled to be joining the City of New York as Chief Technology Officer. As CTO, I will work to ensure that technology and innovation benefit all New Yorkers, in every borough, from every walk of life. Simply put, we’re going to solve problems. I‘m eager to get to work!” said Chief Technology Officer John Paul Farmer. Farmer most recently worked at Microsoft as the Director of Technology & Civic Innovation, based in New York City. In this role, Farmer and his team established the company as a leader in the growing field of civic and urban tech through cross-sector partnerships and new product development. While building this new business unit, Farmer and his team worked in close collaboration with CUNY, Code for America, DataKind, Civic Hall, the NYCEDC, and others. Farmer served on the board of the NYC Tech Talent Pipeline, which works to deliver quality technology jobs for New Yorkers and quality talent for New York City’s businesses. Prior to joining Microsoft, Farmer served as Senior Advisor for Innovation in the White House Office of Science and Technology Policy under President Barack Obama, where he was responsible for the portfolio of technology-based reforms and improvements to government operations, including co-creating and leading the Presidential Innovation Fellows program. He also founded the Innovation Project and has taught at Columbia University as an adjunct professor. Early in his career, Farmer played shortstop in the minor leagues for the Atlanta Braves and Los Angeles Dodgers. “John is a phenomenal innovator at the intersection of public service and technology and will be a huge asset to the people of New York,” said Todd Park, Co-Founder & Chairman of Devoted Health and former United States Chief Technology Officer during the Obama Administration. Farmer holds an M.B.A. with honors from the Graduate School of Business at Columbia University and an A.B. with honors from Harvard University. He lives with his wife, Britt McCandless Farmer, in Greenwich Village. His first day as CTO is June 3rd. The Mayor’s Office of the Chief Technology Officer works to make broadband, smart city technologies, digital services, and the tech industry work for all New Yorkers. NYCx Challenges: Challenges are open competitions that invite entrepreneurs, startups, technologists, researchers and tech professionals to help tackle specific priority problems of urban life. All Challenges aim to move New York City towards the principles laid out in Mayor De Blasio’s OneNYC plan: growth, equity, sustainability, and resilience. The Guidelines for the Internet of Things (IoT): The Mayor’s Office of the CTO puts forth a set of best practices and resources for using smart technologies responsibly. More than 35 leading cities have signed on to New York City’s guidelines. Smart City Initiatives: The Mayor’s Office of the CTO works across City agencies to find ways that smart technologies+ can improve services and equity for all New Yorkers. The Bronx Academy of Art & Dance presents its annual spring dance and performance festival THE BOOGIE DOWN DANCE SERIES from Tuesday, April 30 to Saturday, May 26, 2019 at BAAD!, 2474 Westchester Square in the Westchester Square section of the Bronx. The BOOGIE DOWN DANCE SERIES makes way for professional, contemporary dance and performance in the Bronx and takes its title from the borough’s nickname, The Boogie Down. The festival features dance that vibrates with Bronx energy and a diversity of expressions from around the city, and performance that flirts and engages with cutting-edge ideas. This year includes the screening of Bronx Gothic, a documentary about the award-winning Okwui Okpokwasili’s groundbreaking national show that had its final performances at BAAD!, and performance partnerships with PEN World Voices and the Itinerant Festival. Tickets for events range from $10-$25 with some free events and discounts available for students, seniors, groups, Bronx Cultural Card Holders, NALAC (National Association of Latino Art and Cultures) and to Bronx residents. Call 718-918-2110 or visit website: www.BAADBronx.org for tix, info and additional directions. The Boogie Down Dance Series is sponsored in part by the New York State Council on the Arts, The New York City Department of Cultural Affairs and the Mertz Gilmore Foundation. This evening bubbles with the energy of club, house and street dance. Curated by Rokafella (Full Circle), performers include Samantha Reyes (Sam-I-Am), Kristine Bergasse, Hip Hop Theory andThe ICONIC Legendary House Of Ninja. Followed by a dance party. Growing up in rural Nicaragua, queer performance artist Elyla Sinvergüenza (Fredman Barahona) endured the country’s toxic and ongoing legacy of colonialism. In their visceral new performance piece Saint Peter Goose/Duck Pulling, Sinvergüenza transforms a violent and hyper-masculine ritual from the country’s patriarchal tradition into an immersive experience of healing for artist and audience members alike. Supported by the Andy Warhol Foundation for Visual Arts and co-presented with PEN America World Voices Festival and the Artists at Risk Connection (ARC). ​The Other Side of Silence (TOSOS) presents is founder, Doric Wilson’s seminal work which focuses less on the events of June 28, 1969 Stonewall uprising and more on the panoply of diverse individuals who made those events happen. Originally produced in New York City at The Mineshaft bar in 1982, this play is one of the most annually produced works. Directed by Mark Finley. From the Femme-identified Michiyaya Dance group to the gender expansive Mx Oops and the dynamic duo of Pittsburgh Slowdanger, a deliciously daring dance evening sweeps onto BAAD!’s stage with work that is unpredictable and engaging. BAAD! 's signature compilation dance concert brings together a bevy of dance styles and talents with 8 choreographers from the Bronx and beyond. Choreographers include Tadashi Kato, John Kovach, Moriah Ella Mason, Cynthia Paniagua, Margia Shriti, and Rourou Ye. From director Andrew Rossi (Page One: Inside the New York Times, The First Monday in May) comes an electrifying portrait of writer and performer Okwui Okpokwasili and her acclaimed one-woman show, Bronx Gothic, which had its final performances at BAAD! Rooted in memories of her childhood, Okwui fuses dance, song, drama, and comedy to create a mesmerizing space in which audiences engage with a story about two 12-year-old black girls coming of age in the Bronx in the 1980s. With intimate vérité access to Okwui and her audiences off the stage, Bronx Gothic allows for unparalleled insight into her creative process as well as the complex social issues embodied in it. ITINERANT, the annual Performance Art Festival of NYC, is a week of Live Action Art in different boroughs in New York City. ITINERANT at BAAD! presents a selection of P​erformance ​A​rt works by local and international artist​s. This year’s festival focuses on works that explore, treat, propose, and consider somatic (re)constructions and (re)presentations regarding gender, nationality, identity, and civil status. The program, organized and curated independently by interdisciplinary artist Hector Canonge, brings a mix of local and international artists. The full festival takes place Monday, May 20th to Saturday, May 25th at various venues in the city. Bianca’s life as a dull elementary school teacher is boring and frustrating until Antonino, the school’s dean, enters it. The hope of an improbable love affair illuminates a life of solitude, injustice, and denial. Written and directed by Silvia Marchetti and presented by Compagnia del Calzino – Region Emilia Romagna. Anita’s everyday life masks a hidden 'otaku.' Marked by a difficult past, she finds refuge at home, where her contradictions coexist with her controversial sexuality. Written and directed by Tiziana Troja, and presented by Lucidosottile. Crowned “a funky and welcoming performance space” by The New York Times, BAAD! is a performance and workshop space that presents cutting-edge works in dance and all creative disciplines empowering to women, Latinos and people of color and the LGBT (lesbian, gay, bisexual and transgender) community. BAAD! 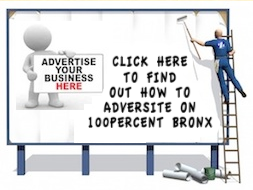 is home to Arthur Aviles Typical Theatre (AATT) and the Bronx Dance Coalition and was founded by Arthur Aviles and Charles Rice-Gonzalez in 1998 in Hunts Point. BAAD! moved to Westchester Square in October 2013 to a gothic revivalist building on the grounds of St. Peter’s Church. BAAD!/AATT receive support from The Ford Foundation, The SHS Foundation, The NYC Department of Cultural Affairs, The Howard Gilman Foundation, The Lincoln Center Cultural Innovation Fund supported by The Rockefeller Foundation and administered by Lincoln Center, The Mertz Gilmore Foundation, The Emma A. Sheafer Charitable Trust, The Jerome Foundation, The Dance/NYC Dance Advancement Fund supported by the Ford Foundation, The Harkness Foundation for Dance, The New York State Regional Economic Development Corporation, he New York State Council on the Arts, Councilmember Mark Gjonaj and Ruben Diaz, Sr., and private donations. Mayor Bill de Blasio today appointed eight commissioners to the New York City Civic Engagement Commission and named Dr. Sarah Sayeed as Chair and Executive Director of the Commission. Collectively, the newly appointed commissioners represent every borough and have a range of experience engaging and advocating for New Yorkers from all walks of life, including people with disabilities and immigrants. In addition to promoting civic trust and strengthening our democracy, the commissioners will be responsible for establishing a citywide participatory budgeting program, providing language interpretation services at poll sites and supporting community boards to help them be more effective and more representative of the communities they represent. New Yorkers overwhelmingly voted to establish the Civic Engagement Commission in November of 2018. After a robust call to encourage New Yorkers to apply to the Commission, the City received more than 300 applications through the City’s open application process. Six of the eight Mayoral appointees were chosen through this process. The Commission will hold its first public meeting within the next 30 days and launch a listening tour across the five boroughs to hear directly from New Yorkers. The Commission also launched a new website where more information on their work, including the schedule of public meetings, will be available. The website can be accessed here. “I envision this Commission as a catalyst to ignite community awareness and involvement in ensuring New York City’s social equality,” said Civic Engagement Commissioner Donna Veronica Gill. Dr. Sarah Sayeed, Chair and Executive Director of the Civic Engagement Commission, is a Bronx resident and has been dedicated to building an inclusive public square for almost two decades. For the past three and a half years, Sayeed has been a Senior Advisor in the Mayor’s Community Affairs Unit, where she has strengthened the civic engagement of a diverse, multi-ethnic and multi-lingual Muslim constituency. Prior to this, she worked for over seven years at the Interfaith Center of New York, bringing together New York’s diverse grassroots religious leaders with secular and city agencies, and implementing an extended collaboration between Catholic and Muslim social service providers. Sayeed also taught Communications to graduates and undergraduates at Baruch’s School of Public Affairs for five years. Through her years of volunteer work with diverse Muslim organizations, including Women in Islam, Inc., she has been an avid promoter of interfaith relations and Muslim women’s public engagement. Sarah holds a B.A. in Sociology and Near East Studies from Princeton University and an M.A. and Ph.D. in Communications from the Annenberg School for Communication, University of Pennsylvania. She also holds a certificate in Reconciliation Leadership through the Institute for Global Leadership and is an alumna of the American Muslim Civic Leadership Institute (AMCLI) Fellows program. Murad Awawdeh is a Brooklyn resident and Muslim-American son of immigrants. He is the Vice President of Advocacy at the New York Immigration Coalition where he oversees the community, member, civic and political engagement departments. In addition, Awawdeh also serves as the Political Director for the New York State Immigrant Action Fund. Awawdeh is the President of Yalla Brooklyn, which is an organization committed in engaging Arabs and Muslims in the electoral process. He also is the President Emeritus of the Muslim Democratic Club of NY, the Chair of the Immigration Committee for Justice 2020 Initiative, and is a board trustee of New York University Family Health Centers. Holly Bonner is a Staten Island resident who is legally blind and the founder of Blind Motherhood. Bonner founded an online blog, Blind Motherhood, which is dedicated to proving that blind and visually impaired parents execute their parental duties independently, effectively and safely. In addition to her online blog, Bonner also is a contributor to NBC’s TODAY Show as a Parenting Columnist, Coordinator of the American Foundation for the Blind’s ‘Blind Parenting Series’, an Adjunct Psychology Professor at Metropolitan College of New York, and the Staten Island Borough Coordinator for VISIONS Services for the Blind & Visually Impaired. Bonner received a Master’s of Social Work from Colombia University School of Social Work and is a candidate for a Doctorate in Ministry at New York Theological Seminary. Amy Breedlove is a Brooklyn resident, self-identifying member of the LGBTQ community and a Business Strategist at Urban Quotient. She’s a consultant to various architectural and design firms and also serves as the President of the Cobble Hill Association. Breedlove is a board member, treasurer and Chair of the Intergovernmental Affairs Committee of Stonewall Community Development Corporation, an organization focused on developing affordable and supportive housing for LGBTQ seniors. She received degrees from the University of the Arts in Pennsylvania, Rutgers University in New Jersey, and ESSEC Business School in France. Donna Veronica Gill is a resident of Manhattan and a Higher Education Officer at Hunter Bellevue School of Nursing. Gill also advises the New York State Youth Leadership Council, which works with immigrant youth through various programs including leadership development and educational advancement, on Higher Education and educational funding. Gill is lifelong resident of Harlem, a member of Community Board 10, and volunteers with CUNY’s Citizenship Now program, which helps immigrants complete applications for citizenship, DACA, TPS and other programs. Gill received her Degree in Higher Education Administration from Baruch College. José Hernandez is a Bronx resident, paraplegic and is the President of United Spinal Association’s New York City chapter. Hernandez became paralyzed when he was a teenager and works closely with disability rights groups. He volunteered with the Wheels of Progress Inc., served on the organization’s advisory board and helped them redesign and maintain both their website and social media. Hernandez previously worked as the Communications Coordinator for Concepts of Independence. He received his bachelor’s degree from St. John’s University. Linda Lee is a Queens resident and the Executive Director of the Korean Community Services of Metropolitan New York, Inc. (KCS). She is a member of Community Board 11 in Queens as well as a board member for the National Alliance on Mental Illness of New York City and the Korean Church of Queens. Lee is the National Community Committee Representative at the Center for Disease Control: Prevention Research Center. She has been recognized as a recipient of the Stars Under 40 Award from Schneps Communications and 40Under40 Award as a rising star from NY Nonprofit Media. She received her Bachelor’s Degree from Barnard College and Master’s Degree in Social Work from Columbia University. Annetta Seecharran is a Queens resident, non-profit leader and is the Executive Director of Chhaya CDC. Before joining Chhaya CDC, Seecharran was the Director for Policy and Advocacy for United Neighborhood Houses, a Program Director for International Youth Foundation, and Executive Director of South Asian Youth Action (SAYA!). She is a current and former member of several local and national boards, including Chayya CDC, and a founding member of New York State Immigration Action Fund. Seecharran received degrees in non-profit management from both Harvard Business School and Colombia Business School. In November 2018, New York City voters overwhelmingly approved three ballot initiatives proposed by the 2018 Charter Revision Commission, which included campaign finance reform, community board term limits and the establishment of the Civic Engagement Commission. The Commission will be responsible for enhancing civic participation, promoting civic trust and strengthening democracy in New York City. The Commission will have 15 commissioners. Eight are appoint by the Mayor, two by the City Council and one by each Borough President. Initially, three Mayoral appointees (Gill, Breedlove and Lee) will serve two-year terms; four Mayoral appointees (Awawdeh, Bonner, Hernandez and Seecharran) will serve four-year terms; Borough President appointees will serve three-year terms; one City Council appointee will serve a two-year term and one will serve a four-year term. After the initial terms, all future appointments to the Commission will be for four-year terms.